Get a chance to win a stacked prize package and support ALS research with this Digital Musician Contest from Every90Minutes, Gravitas Music and Dubspot. Dubspot is proud to contribute to the Digital Musician Contest contest benefitting ALS funding and research. 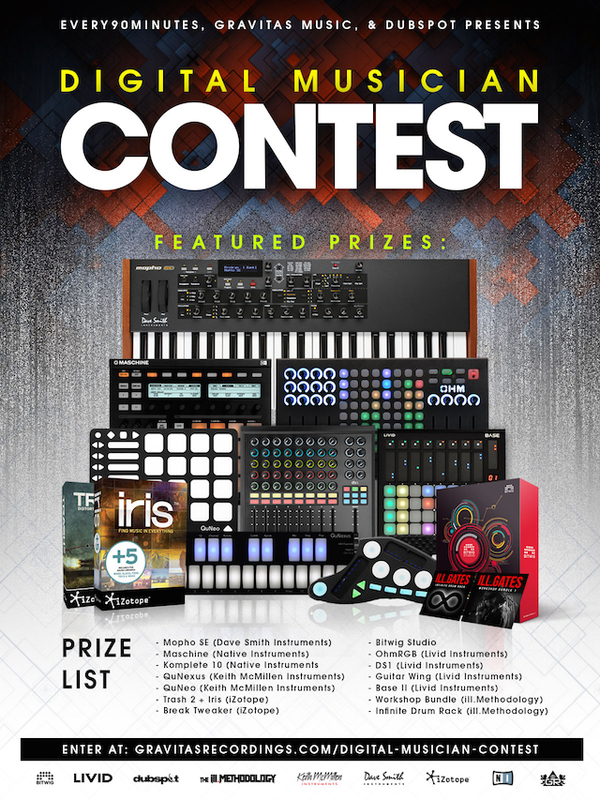 Check out the impressive prize list below featuring synthesizers, controllers, software, and workshop packages from some of the top names in electronic music education and gear. You can also support The 90 Foundation by purchasing the “Beat ALS” compilation featuring tracks from Richie Hawtin, Machinedrum, Bass Nectar, ill.Gates, and more. Click here to enter the contest and support. Beyond moving bodies and stirring emotion, music can also be a powerful vehicle for social change. Every90Minutes, in conjunction with Gravitas Recordings, has curated a unique compilation of electronic music for an important cause. “Beat ALS” spans 17 tracks across a number of genres with 100% of the proceeds directly benefiting Every90Minutes, a 501(c)3 nonprofit organization dedicated to funding ALS research through music and events. The release features a truly memorable cast of international talent including Bassnectar, BT, Tritonal, Richie Hawtin, Dub FX, John Acquaviva, ill.gates, Matthew Dear, Machinedrum and many more. Track vibes ranging from dubstep to techno meet downtempo and cinematic sections with class, weaving a sense of poetic diversity throughout the album. Jay Smith, the Founder of music tech company Livid Instruments, started Every90Minutes after his own diagnosis with ALS earlier this year. The Foundation is dedicated to funding the most promising research and treatment for ALS, and provides an inspirational beacon for others affected by his disease. Apart from the “Beat ALS” compilation, Every90Minutes is working on a number of multifaceted initiatives to raise both funds and awareness for ALS. Support of each project directly furthers research to end this debilitating and ultimately fatal disease. Can you do some turntables?